Track all of the expenses and revenue related to your business with our comprehensive (yet simple!) tracking tool! Log all of your business finances by category and review in the graph dashboard to help you fully understand your budget. As a business owner, whether large or small, you are going to incur expenses, and (hopefully!) earn a bunch of revenue. While doing so, you must keep track of what you are spending and earning, and match that data with your business’ progress. If you are looking for a powerful yet simple way to track your expenses and income without being too granular with cash flow statements etc., then this is the income and expense tracker for you. Analyze your business growth, keep yourself organized for tax season, determine what is working and what isn’t from a financial perspective, and ultimately make more moolah! Note: Click to see the Personal Income and Expense Tracker or the Traffic and Income Tracker for Bloggers. With this tool, you will be able to input your top 3 business expenses (or fewer, if you wish to hide columns), as well as any less significant “Other Expenses” on a different sheet/tab. Here, you can write each specific expense type which will then be displayed by category, if you wish to break down the data to that extent. The same options are available for revenue tracking as well. There is also a pie chart that updates automatically to tell you how your expenses or revenues are allocated. This is a simplified but very powerful expense tracker. It is designed for those that are looking for a “simple to understand and use but can track everything they need” tool. BUY NOW FOR JUST $12! It’s impossible to find a general business expense and income tracker that will be able to address every expense and income your business gets. 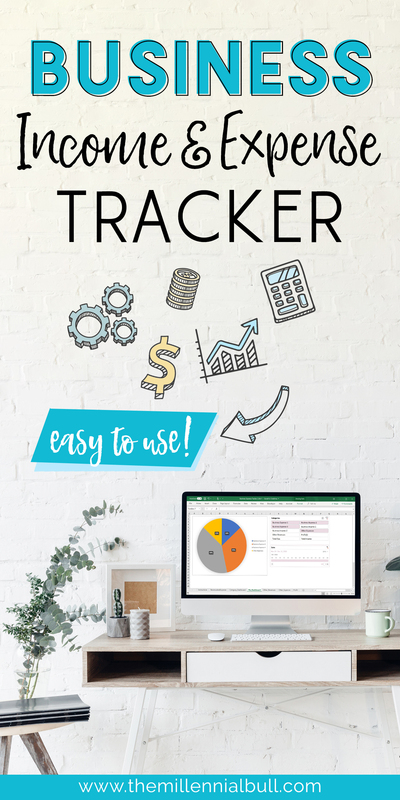 So, if you are looking for an expense tracker spreadsheet that is exactly tailored for your specific business, this is not the one for you. Something that is more tailored to your business will cost you many hundreds of dollars if not thousands (depending on your needs). On the flip side, a general business expense and income tracker can be created that may be able to cover EVERY line item your business needs however, that tool will not be so simple to use. The reason is that in order to create a tool like that, you have to make sure that any business using the tool has all the needed line items which means that the tool may have too many line items that are confusing. As a user, you then have to go through all the line items and choose and exclude what you may or may not need. This can be tedious. Some people just want something a bit more simple, not quite as detailed but a tracking sheet where they can input their expenses and revenues and maybe a handful of other items. This group of people don’t need things like cash flow statements, balance sheets and the works.